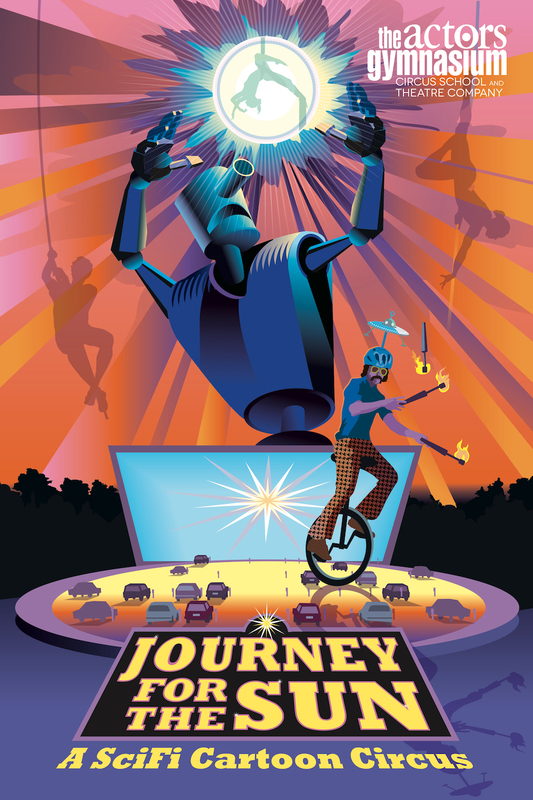 Journey For the Sun, A SciFi Cartoon Circus from The Actors Gymnasium’s is visually stunning and well worth seeing. A couple of weeks ago I got to see the opening night of the show, and it was really great! 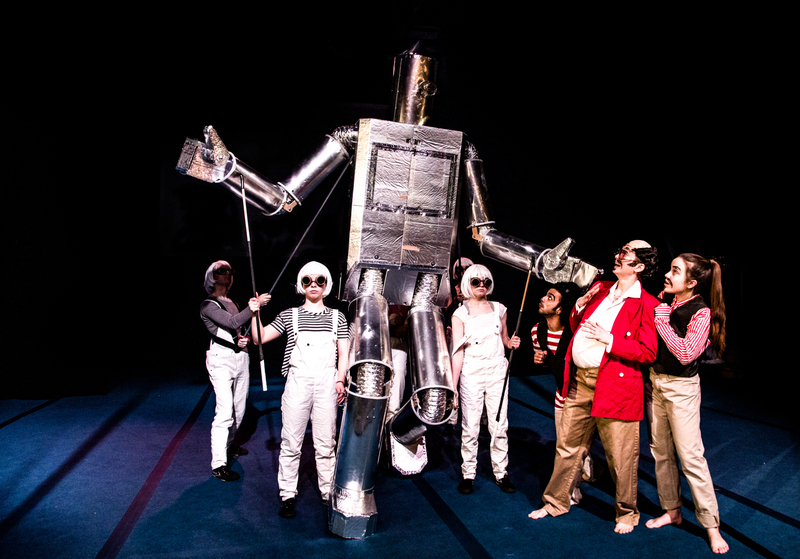 The show features a combination of professional performers and the Actors Gym’s Teen Ensemble, as it tells the story of an Indiana drive-in movie theater owner who manages to save the galaxy. The show features lots of acrobatics and aerial acts, as well as a great human beatboxer/foley artist and some amazing visuals. They bill it as a SciFi Cartoon Circus, and it starts out just like that, with cartoons being displayed before the show. The MC or compere is the very jovial Yuri Lane, who punctuates the cartoons with some amazing vocal Foley work. (Beatboxing is when people imitate the sound of the drum machine using just their voice, Foley is when people make sound effects to accompany or to tell a story) He’s got a great set of vocal tricks and he’s very entertaining. The visuals of this play are stunning. The show is co-directed by Frank Maugeri, who is the former director of Redmoon Theater and is the current program director of the Chicago Children’s Theatre. The show bears his visual strengths. The set is well designed in an easy way, with weird objects that are strangely intriguing. At the finale fo the show, there’s a 16 foot tall low tech puppet robot, who is manipulated bunraku style by 6 people, that literally blew my mind when it appeared. Its scale, its design, and its simplicity were fantastic. And then the actors open its chest, and there is a moving scroll that tells a story. I loved it! It was stunning and great and low tech all at once. The book (hmmm… I guess this is the right word, even though it’s not a musical) is written by Seth Bockley, who wrote the play Guerra, which I reviewed for the NY Clown Theatre Festival in 2012 here. It’s sufficiently goofy, and plays with the sci-fi B movie form. As usual in the Actors Gymnasium productions, the pro performers are all really good, although I felt that one of them (Jean Claudio) wasn’t utilized nearly enough. His character had a Chaplinesque feel, but it wasn’t clear to what purpose. He was good at what he did, but he just felt underutilized. I also want to shout out to Kasey Foster whose character work as a gruff elderly wacky drive-in movie owner was pretty darned great. She carries a lot of the plotline with her, and she pulls it off. The teen ensemble is great, and used very well in the production, although I felt there was more aerial work and less old fashioned acrobatics/charivari in this production than usual. Overall, I highly recommend this show, especially if you want to see some great low-tech puppetry and some pretty good circus theatre. « Edinburgh Clown Festival- Kickstarter!